Previous trekking/hiking experience is preferred, though some necessary pre-trip training and practices may be considered in lack of experience. You will be walking for 6-7 hours each trekking day with ascends of 400-700 meters daily. Extreme weather conditions are unlikely, though walking on rocky terrains and steep trails are mostly required. You will be reaching up to the heights of around 4900 meters, so you will experience high altitude air with low-level oxygen. Stay positive and physically fit! Jomolhari trek is the most popular trek in Bhutan offering large variety of beautiful landscape, wild nature with surreal view of Mount Jomolhari(7,326 m ). Jomolhari Trek to Bhutan is what the Everest Base Camp route is to Nepal. Which means a trekking pilgrimage through the rugged uphill and downhill trails all the way to the Jangothang Base Camp. With altitude differences of 8,200 ft and nearly 16,400 ft, it offers a wide range of landscapes, fauna, and flora. The major highlight of this trek is the spectacular view of Mount Jomolhari from Jomolhari Base Camp. Beginning beyond Drugyal Dzong at Shana, in the picturesque Paro Valley you enter the stunning rhododendron forests and weave your way up the valley crossing and re-crossing glistening glacial streams. Eventually, the landscape opens up to grassy meadows and leads to Jangothang where you camp below the sacred peak of Jomolhari (23,996 ft). Jomolhari trek along with Bhutan tours also feature some of the significant attractions of this mystical kingdom. Attractions of this trip are namely ; Tiger’s Nest Monastery, ancient Dzongs (fortresses), sacred temples and ancient towns of Paro and Thimphu. Bhutan is only carbon negative country in the world and it has many natural beauties to be explored with caution. Nature protection is the focus task of Bhutan government and we are joining hands with them in this effort. Jomolahari trek is the most popular trek in Bhutan experienced by true trek enthusiasts from all over the world. Traversing through beautiful villages, discovering ancient Buddhist monasteries, Dzongs (fortresses), pleasing environment of Bhutanese kingdom provides you memorable trekking adventure. Spring (April-May) and Autumn (September-October) are the best seasons for Jomolhari trek and can be participated by anyone with moderate fitness level. With a dedicated team of local trek leaders and guides, Extollo ensures you have the safest and a meaningful trek. 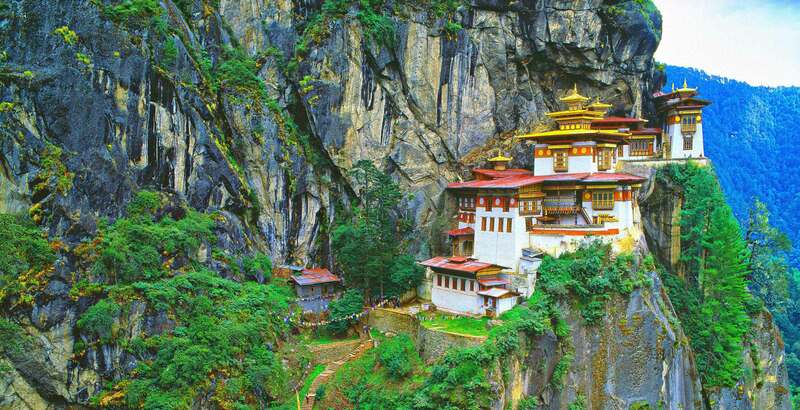 Hike up to the famous Taktsang / Tiger's Nest Monastery, perched on a cliff 900m above the valley floor. The best times to travel to Bhutan are during the seasons of Spring (March to May) and Autumn (September & October). Bhutan celebrates its biggest festivals during April and May thus, it is a perfect time to experience Bhutanese culture. Similarly, during Spring the environment is perfect for hiking adventures and one can cherish rhododendron blooms. You may also visit Bhutan during Summer and Winter, though the climatic conditions are wet and cold respectively, hence quite unfavorable for the best experience. However, you can avoid crowd during these times. Flight to Bhutan offers the most spectacular view of the Himalayan range which includes the sacred Jumolhari and Jichu Drake peaks as our flight descends to Paro. Once in Paro, we will be greeted by a representative from Extollo Adventures and take us to our hotel. As soon as we are ready, our representative will pick us up for some sightseeing. First up is Rinpung Dzong, which was built in 1646 and now houses the District Monastic Body and government administrative offices of Paro Dzongkhag. Today we also visit the oldest temple of Bhutan, Kichu Lhakhang and Drugyal Dzong, which was built in 1646 to commemorate Bhutan’s victory over Tibetan invaders during the 1600’s. Overnight in Tashi Namgay Resort. Today we hike for about 2 hours to Taktsang monastery which is commonly known as Tiger’s Nest. Standing tall at 10,433 feet, the monastery is precariously perched on a cliff face which gives it a surreal look. History has it that Guru Rinpoche (spiritual master) flew on the back of a tigress to meditate in a cave where Taktsang Monastery now stands and served as the divine resting place of the Guru. Surrounded by breathtaking panoramas, we can feel peace and tranquility surrounding us as we ascend the glorious monastery. We will have our lunch in Cafeteria Restaurant, located about halfway up the mountain and then descend down to the valley floor after having explored the monastery. We then drive back to Paro. Overnight in Paro. We begin our trek today from Drugyal Dzong at 8,464 ft with a downhill walk on a wide trail. We then climb gently through well-maintained rice terraces and fields of millet. The route later enters an area of apple orchards and forests. Soon the valley widens and we reach the army post of Gunitsawa at 9,219 ft. This is the last stop before Tibet. At 9,416 ft, just beyond Shana Zampa, there are several good camping places in meadows surrounded by trees. Overnight in a Camp at an altitude of 9,350 ft. The trail follows Pa Chhu (Paro River), ascending and descending through pine, oak and spruce forests. Hot lunch will be served after crossing a bridge towards the left side of the river. After lunch, we follow the river, climb up through rhododendron forests and finally cross another bridge and reach our campsite at an altitude of 12,303 ft. Overnight in a camp/tent. Our path ascends for a while until the army camp. Then, it follows the river above the tree line where we get to enjoy stunning views of the surrounding peaks. Hot lunch will be served at a yak herder's camp. A short walk into the valley will take us to the camp at Jangothang at an altitude of 13,254 ft. From here, the views of Mt. Jomolhari and Jichu Drake are superb. Overnight in a Camp/tent. Today, we rest and acclimatize for next day's trek. After breakfast, we take a 4-hour trip to the northern side of our camp from where we get a beautiful view of the Jichu Drake Peak. We have a picnic lunch on the way. This trip will help us with acclimatization and if we are lucky we may even encounter grazing yaks and blue sheep which makes this trip all the more amazing. Overnight in Camp/tent. The trail follows a stream for half an hour and crosses the bridge to the right. We ascend a ridge and acquire breathtaking views of Jomolhari, Jichu Drake and Tshering Gang from the top. Then we walk towards the valley, almost flat for a while, until the climb to the Ngye La pass (15,970ft). After crossing the pass, it is a gradual descent to the Lingshi camp. Along the way, we enjoy a panoramic view of the peaks and Lingshi Dzong. Camp at an altitude of 13,123 ft. Overnight in a Camp/Tent. The Laya Gasa route leaves the Jomolhari trek here. Instead, the route climbs towards a small white Chorten on a ridge above the camp, then turns south up the deep Mo Chhu valley. The trail stays on the west side of the largely treeless valley, climbing a short distance above Mo Chhu steadily. It then crosses the river and climbs steeply for two hours to Yeli La pass (15,810ft). From the pass, we see Jomolhari, Gangchen Ta, Tshering Gang and Masang Gang. We then descend alongside a stream to a shelter, and then further downstream to camp at Shodu (13,451 ft). Overnight in Camp/tent. Our trail follows the Thimphu River, descending through rhododendron, juniper, and other alpine forests. The view of the cliff facing rocks and waterfalls is stunning. Hot lunches will be served by the riverside. After lunch, we continue our walk as the trail gradually ascends to the ruins of Barshong Dzong. Finally, we end today’s walk by camping at an altitude of 11,810 ft. Overnight in Camp/tent. The trail descends gently through dense rhododendron, birch and conifer forests. We then descend on a steep trail to meet Thimphu Chhu River. Our trail stays on the left side of the river, climbing over ridges and descending to side streams. We then cross a steep cliff to Dolam Kencho, a camp located beautifully amidst pasturelands at an altitude of 11,810 ft After continuing in the southern direction, we reach Dodena and to Thimpu. In the evening, we may stroll through the streets of the capital city, explore the market and get acquainted with the local lifestyle. Overnight in Thimphu. Our journey in the land of Thunder Dragon concludes today as we bid farewell to this exquisite kingdom. We grab our breakfast early in the morning and leave for Paro airport which will take us around 1 hour. Druk Air usually departs in the early morning to avoid adverse weather conditions. Hence, we will be taken to the airport first thing in the morning for final departure. During your travel, you will be staying at Hotel Migmar in Thimphu, Tashi Namgay Resort in Paro and camping tents during the trek. All accommodations are on a twin-shared basis. Hotels in Bhutan are approved and classified by the government as grade A, B and C. These government approved hotels are equivalent to 3-4 star hotels elsewhere. Based on availability at the time of booking, you will be accommodated in A- grade hotels in Paro and Thimphu. All meals (breakfast, lunch and dinner) are included during your stay in Bhutan. A variety of meals are available in most hotels – the most popular being Indian, Chinese, and the more common continental food. Non-vegetarian dishes are generally available in most parts of Bhutan - pork, beef, chicken, and fish. The best advice is to ask the hotel and restaurant to recommend what is fresh and in season. During the trek, you will be provided 3 meals a day – breakfast, hot picnic lunch on the way, and dinner at the campsites with evening tea and snacks. Extollo Adventures’ trekking cooks are well trained and can whip up delicious meals at any altitude. If there are any special dietary needs, you are requested to inform the company prior to the trip. When is the best time to visit Bhutan for trekking and hiking? Spring and Autumn are the most popular time to visit Bhutan. During Spring, one can experience cultural Bhutanese festivals, especially during April and May. It is also warmer and skies are clearer for amazing sightseeing tour. The climate is also favorable during Autumn (September and October) for a perfect hiking holiday exploring ancient fortress of Bhutan. 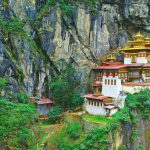 Is it possible to travel Bhutan during Summer and Winter? Yes, of course you can visit Bhutan during Summer/Monsoon (June to August) and Winter (December to February). You can enjoy the hiking tour with less crowd but the climatic conditions are not quite favorable during these seasons. Summer and Monsoon will be wet and the winter has very cold weather, thus you may not experience the best holidays in Bhutan during these seasons. What are the documents that I need take with me to Bhutan? Visa confirmation letter is the first important document, so keep it with you all the time and make a copy of it too. We shall help in your visa processing for Bhutan prior to the start of your trip. Also take a copy of your tour itinerary with you. Is there any weight limit for luggage on Druk Air? You can carry up to 20 kg in economic class and 30 kg in business class. An extra 5 kg is also allowed to store in overhead baggage bin or under passenger’s seat. Can I have a private tour? Yes, definitely. We can arrange you a private tour too as per your demand and flexibility but under Bhutanese state laws. Is it possible to customize my itinerary? We offer customization in the itinerary to our valued clients. After all it is you traveling and it must be beneficial to you according to your interests. Indeed, we have carefully crafted and specially designed our itinerary but you have the right to amend it and make necessary changes. Please let us know and we shall make changed accordingly. What are the provisions for drinking water on the trip? It is better to purchase mineral water which is readily available all along the Bhutan tour. Choose the recognized brand rather than the local brands and avoid the tap water which is not quite safe. liability, cancellation, curtailment and loss of luggage and personal effects. emergency funds will be highly recommended. Generally, we do not charge solo travelers any extra charge. You will be paired up with another traveler of same gender and hotel room will be provided on twin sharing basis in Bhutan. On request, you will be provided a single room in Bhutan with a single supplement charge. Dress Code: One should remember to dress appropriately while visiting Dzongs, monasteries and temples. * Tie is not required. Photography: Bhutanese in general pose for photographs. However, make sure to ask for permission from the concerned person before you take a shot. Taking pictures inside dzongs, temples, monasteries and museums are prohibited. Smoking/Tobacco prohibition: Bhutan bans smoking in public places, and prohibits growing or importing tobacco. You must always be able to produce proof of purchase of products such as Invoice or bill at the airports or entry points (borders). On demand, you must also produce a receipt of tax payment, failing to adhere to this rules will result in third degree felony punishable by three years in prison. *Tobacco products imported from India shall pay 100% Sales Tax and from countries other than India shall pay 200% duty.